WEST LEBANON, N.H. — Senator Rand Paul has been called “the most interesting man in politics” by Time magazine. As late as last fall, many Republicans viewed him as the front-runner for the Republican nomination for president in 2016. In New Hampshire, especially, he was expected to build on his father’s second-place success in the first-in-the-nation primary. But so far, the Kentuckian’s presidential campaign is faltering. This summer, the most interesting man in politics is Donald Trump, who also leads national GOP polls. The same surveys show Paul sliding to the middle of the pack in New Hampshire and even further nationally. He’s visited the Granite State — a key early nominating contest for him — only twice since May. He took three more questions before moving on with his six-town swing through northern New Hampshire. During an afternoon interview in the Warren gazebo, Paul chalked up his sliding poll position to the large GOP field. Sixteen Republicans have announced they will seek the White House in 2016. 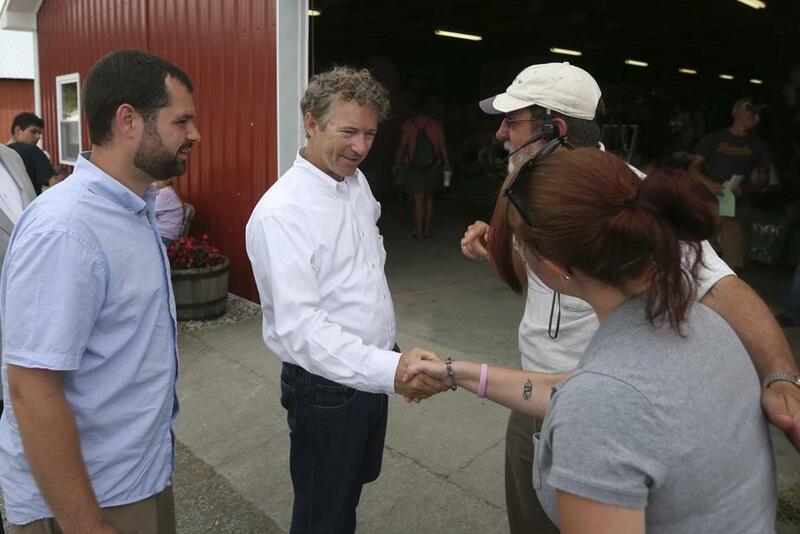 Paul walked through the fairgrounds with a supporter. In October, national polls showed Paul received support from 13.5 percent of Republicans, according to an average from Real Clear Politics. In July, an average of similar surveys showed Paul with support from 5.7 percent of Republicans. Among New Hampshire Republicans, a Bloomberg Politics/Saint Anselm poll from November showed Paul tied for first place with 16 percent among Republicans polled. On Tuesday, a Monmouth University survey showed him tied for sixth place with 5 percent. Paul’s fund-raising is also lackluster. 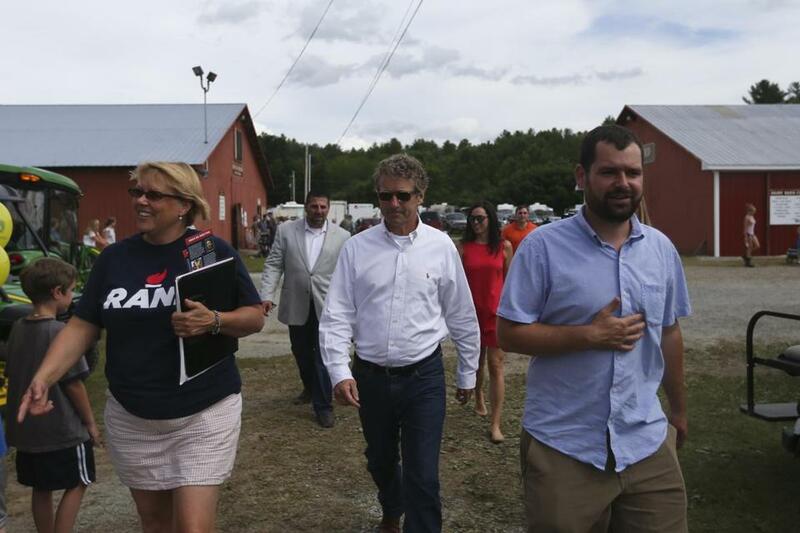 Paul’s campaign and his super PAC raised among the least of the major contenders for president. For example, the main super PAC backing Paul raised $3.1 million. During the same time period, the super PAC for former Florida governor Jeb Bush brought in more than $103 million. What’s more, Paul’s campaign operation is suffering from infighting and low morale, according to a Tuesday report from Politico. During an April event in New Hampshire, Paul’s campaign manager got into a physical altercation with his bodyguard, per the report. But perhaps most concerning for Paul, the issues that are driving the primary — terrorism, immigration, and the economy — are not in his policy wheelhouse. Paul built his libertarian candidacy on a non-interventionist foreign policy and crusading against the National Security Agency overreach. Paul dismissed the criticism from his opponents as “jealousy.” Invoking the Granite State’s motto, he said his positions are what makes him stand out in a crowded field. Indeed, one of Paul’s key supporters in the state, Newmarket Councilor Phil Nazzaro, predicted Paul would be the candidate talking about serious issues this fall. Paul and his aides stress the campaign season is long and that there will be different front-runners throughout the primary. They say they are playing the long game. His campaign has been organizing in overlooked caucus states and already begun the process of calling through voter lists. US Senator Rand Paul, Republican of Kentucky and presidential candidate, talked to voters Saturday at the North Haverhill fair in Haverhill, N.H.